A quick introduction to the concept of open access in universities. This video was produced by the Canadian Association of Research Libraries and McGill University Library. Posted in Academic publishing | Comments Off on What is open access? …gives your work more exposure. By making by making your work openly available on the internet, it can be found via most search engines (like Google). …provides universal access to your work. It is no longer hidden behind subscription barriers, and it can be accessed by everyone not just those who can pay. …meets the requirements of many funding agencies. Many funders stipulate that research be made publicly available since it is being funded by the public. eScholarship@McGill meets this requirement. The SPARC Canadian Author’s Addendum is a legal instrument that helps you modify the publisher’s agreement and keep key rights to your article. Rather old news, but still of interest! Last year, the publisher Taylor & Francis conducted a survey of 1,500 Canadian researchers on their publishing preferences and information seeking strategies. The full report can be read online. Unsurprisingly, when selecting a journal in which to publish, participants considered timeliness of the review process and reputation of the journal to be most important. More than 70% indicated that the “right to circulate the article after publication” to be very important or important, which has important implications for the uptake of open access policies in Canada. It would appear that respondents could enter more than one option, since the percentages add up to more than 100, but at any rate, 64% selected Google as a starting point. Next in popularity was library websites (54%), followed by JSTOR (31%). It would be interesting to get more nuanced data, though, as to whether researchers took the question to refer to starting points for tracking done known citations or for surveying research literature in general. JSTOR, of course, does not include the most recent issues of most journals, so it’s not usually recommended as a starting point for research. In other Taylor & Francis news, their online journal platform has recently undergone some updates to refine the search functions and article displays, including mobile access. Note that journals previously accessible from Informaworld are now part of the Taylor & Francis suite. McGill subscribes to 182 Taylor & Francis journals in Political Science and International Relations. ISI’s 2010 Social Sciences Journal Citation Reports are now available. Among other subjects, rankings for journals published in the fields of Political Science and International Relations are included in the reports. *American Political Science Review was again cited most frequently overall. *International Organization was again cited most frequently overall. I wrote more about journal rankings last year—always a controversial topic! Back in April, Library Journal published the figures from its annual Periodicals Price Survey. The news once again is, well, bleak…as subscription prices are increasing at a rate higher than the Consumer Price Index, while library funding (both public and academic) is decreasing. Inquiring minds might be interested to know that Chemistry journals tend to break the bank, with an average price of more than $4,000 for a single annual subscription. The average Political Science journal, among those indexed in the Social Sciences Citation Index, costs $622 per year. This represents a 9% increase since 2009. It is projected that costs for social sciences titles in the index will increase by 6.6% by 2012. See the full article for more details, as several data sources are analyzed. The most recent issue of Undercurrent, the Canadian Undergraduate Journal of Development Studies, is now available. This issue is a compilation of work by undergraduate scholars from across Canada. The essays presented there reflect Canadian students’ views and research relating to a variety of topics dealing with international development. Topics include Chinese involvement in Sudan, the work of youth in Guatemala, and a Marxist critique of microcredits, among other illuminating pieces. The issue is available free for download, or for sale in hardcopy through Lulu.com. The blog The Imaginary Journal of Poetic Economics is a great destination for learning more about open access. IMAGINE A WORLD WHERE ANYONE CAN INSTANTLY ACCESS ALL OF THE WORLD’S SCHOLARLY KNOWLEDGE – AS PROFOUND A CHANGE AS THE INVENTION OF THE PRINTING PRESS. TECHNICALLY, THIS IS WITHIN REACH. ALL THAT IS NEEDED IS A LITTLE IMAGINATION, TO RECONSIDER THE ECONOMICS OF SCHOLARLY COMMUNICATIONS FROM A POETIC VIEWPOINT. What would scholarly communication look like if we invented it today? “What would scholarly communication look like if we invented it today?” by Cameron Neylon at Science in the Open. Posted in Academic publishing | Comments Off on What would scholarly communication look like if we invented it today? 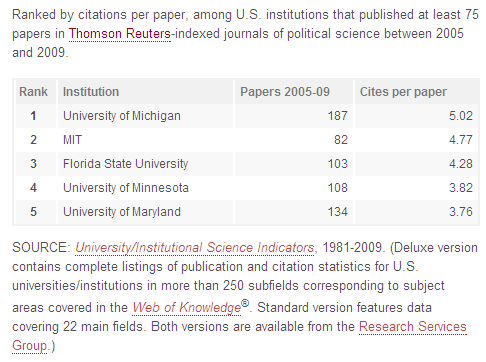 Universities ranked by citations per paper, among U.S. institutions that published at least 75 papers in Thomson Reuters-indexed journals of political science between 2005 and 2009. SOURCE: University/Institutional Science Indicators, 1981-2009. The McGill library has several new web pages about open access, explaining why it’s such an important issue for researchers and students. The Canadian Association of Research Libraries (CARL) has partnered with the McGill University Library and University of Toronto Libraries to produce this advocacy video and a webcast on the issues of open access and proposed copyright reform in Canada. The roughly one minute animated video explains the concept of open access to students and faculty in a simple and fun format. The video is available in both French and English, can be placed on websites, displayed on monitors in libraries during open access week, and is available for free and is licensed under a Creative Commons license. It can be viewed at http://www.youtube.com/user/McGillLibrary or on the library’s website.